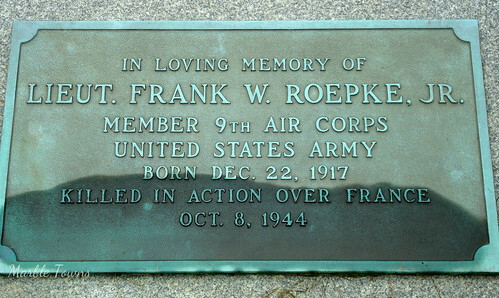 Since it is 11/11, I wanted to post a military grave photo today. Welcome to Taphophile Tragics — and please do post your own links. It’s always nice to see where other people are taking photographs. So, thank you for visiting! I have had no success getting the script tool from LinkyTools or from Inlinkz to work properly, so I’m still doing the open-the-links-in-a-new-tab thing (which I do not like). If anyone out there has any ideas why the script is disappearing when I save my drafts, I am open to ideas and suggestions. My photo today comes from Elmwood Cemetery in River Grove, Illinois. This marker caught my eye because it mentions World War II and The Black Panthers. Looking for Mr. Calamus, I found him on the 1940 census, where he listed as being employed as a machinist, married to Calleen, and with sons James and Lewis. His enlistment record shows that he enlisted on March 24, 1944 and was released on November 21, 1945. 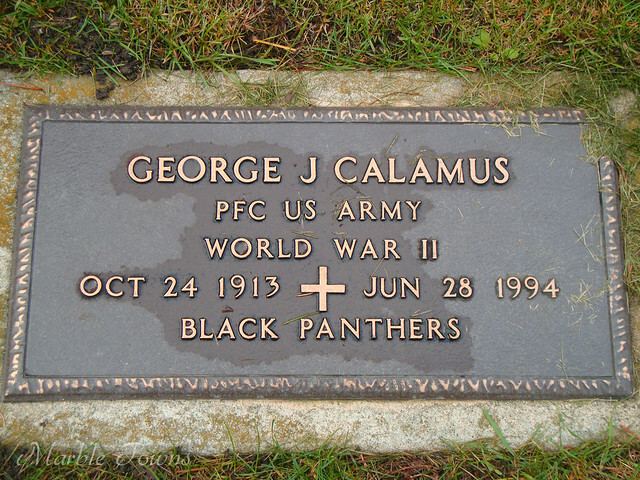 I looked up the Black Panthers, and because Mr. Calamus was in the U.S. Army, I am thinking he was in the 66th Infantry Division, which had a campaign in northern France. I found information on this division on this page, as well as a Wikipedia entry. There was also a tank battalion called the Black Panthers, but since that was made up primarily of African-American soldiers, and on the census, Mr. Calamus’ race is listed as White, I thought he was perhaps in the 66th Infrantry Division. However, I wasn’t able to find much information about Mr. Calamus on Ancestry.com, so I’m not sure. 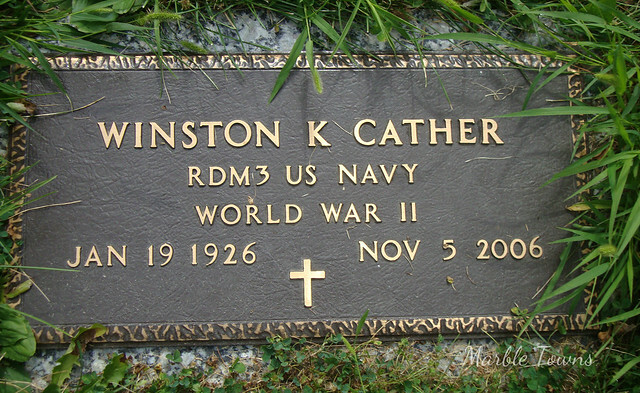 Winston Cather is buried in Pearce Cemetery in Oswego, Illinois. I had to look up what RDM3 was, and found it was Radar Watch and Operate Radar Equipment. So, he was a radar-man in the Navy during World War II. I wasn’t able to access Ancestry at work while I was working on this post, but I did find his obituary, which, interestingly, lists his date of birth as January 19, 1928. Winston “Winnie” Keith Cather, 78, of Aurora, died on November 5, 2006. Winnie was born on January 19, 1928 to Harry and Fanny (Link) Cather, in Oswego, Illinois. Winnie enlisted in the Navy during the late 1940’s and ser-ved as a Radioman. He was very proud of his Military service. He was also a lifelong Cubs fan. Winston worked for the Burlington /Northern Railroad (17 years) and the Aurora Beacon-News (24 years). Winnie married Bette Wells in 1957 and she preceded him in death in 1988. Also preceding him in death were his parents, Harry and Fanny Cather, sisters, Nona, ILA, and Doris, brothers, Delmas, Gerald, and Cyril. Winston’s Survivors include his Brother, Gayle Cather, sisters, Bernice, Muriel, and Monette; children; Bruce (Pamela), Andrea (Dave) Karas, Michael (Gayane), Michele, Craig, and daughter Lana from a previous marriage to Vivian Garret-Alfaro; grandchildren, Melanie, Misty, Monica, Kristen, Aubrey, Ben, Evan, Eric, Elise, Abby, David; great grandchildren, Tyler, Leia, Lydia, and Lilly. Winnie is preceded in death by his parents, and wife Bette.